I knew the moment the pain soar through my knee that my training schedule and possible even my ability to compete in the future had just been seriously disrupted. It didn’t matter which of the most common knee injuries I had, I knew I had to find the best type of exercise bike to rehab knee; and quickly! 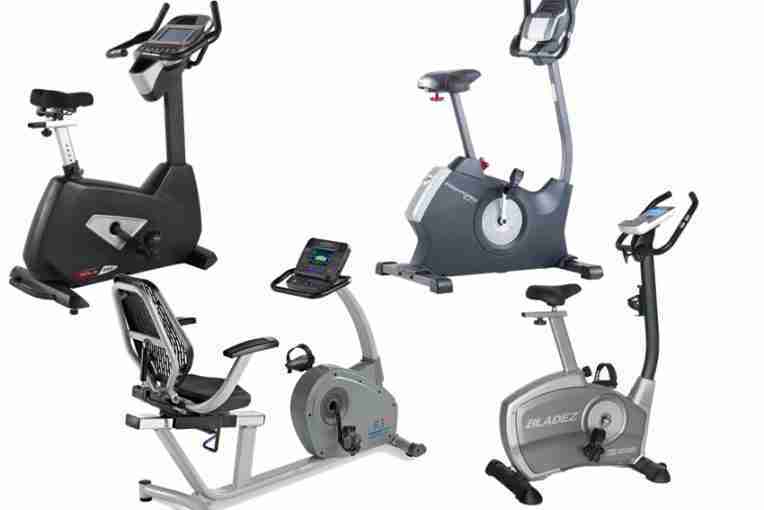 Of course I was fortunate; a friend who managed a gym was just about to order some new exercise bikes but couldn’t decide which he should go for. He invited me to join him testing a variety of different ones. That’s how I came to realize that the Sunny Pro Indoor cycle was the best one for my needs. Research shows that exercise bikes are a great way of rebuilding strength and mobility in your knees and helping to deal with chronic knee conditions. But there remains a debate regarding recumbent versus upright. The recumbent bike allows you to sit back, giving you back support while you pedal. My experience was that this was good for improving movement of my knee and reducing pain. But, it did nothing to help build strength. This is an issue for me! In contrast the upright is more strenuous and potentially painful on my knees but it still provided an improvement of movement, reduction of pain and helped me to maintain my strength levels. It also continued to work my core, back, shoulders, arms and buttocks. In short there is a place for both types of exercise bikes; depending on what your goals are. Add in one of the best elliptical trainers and my road to recovery was much quicker than expected. In fact I was shopping for triathlon shoes and a new wetsuit less than a month after injuring my knee. I loved this bike when I used it. It had a great range of adjustment and was exceptionally comfortable. It’s really well made without the creaks and groans that quickly put you off riding again and again. Sunny Health & Fitness are based in Los Angeles and have been distributing some of the best fitness equipment on the market for in excess of 15 years. They source their machines from Taiwan and China but are dedicated to providing only the best equipment. Size: 20” x 46.5” x 48.5”. The Sunny Pro indoor cycle is exceptionally well made. It feels solid as soon as you sit on it. There is no apparent wobble and heavy duty crank ensures vibration is kept to a minimum. This bike feels like it will stay exactly where you put it and it is exceptionally smooth; even if you try standing up to pedal; (which I don’t recommend with a knee injury). This crank is complemented by a 40 pound flywheel and a steel frame ensuring the Sunny Pro indoor cycle will remain stable regardless of what you throw at it. The bike also benefits from adjustable knobs to counteract any unevenness in your floor. The handlebars and the seat are fully adjustable. This means you can get comfortable no matter how tall you are or what size you are; it can comfortably and confidently handle people up to 275 pounds. The heavy flywheel does more than help to keep the bike stable. It also provides some serious resistance. This makes it harder to get the bike going and more similar to riding in the great outdoors. Just like with a road going bike there is very little maintenance that needs to be done; lubricating the chain and adjusting the brake pads are about it! You’ll find there is simple knob to increase or decrease the resistance of the bike. There are no markings on the knob but you can turn it while you’re riding to simulate up and down hill sections. The resistance is created by tightening brake pads onto the flywheel; simple but effective. Within a short space of time you’ll know exactly where to position the knob to get you started. A steel frame and a 40 pound flywheel equates to a heavy job when constructing the Sunny Pro indoor cycle. You’ll probably want to leave it in one position once you’ve set it up. Setting it up is pretty straight forward but you may want a friend to help with the weight of it. In the digital age it is unusual to find something without a data hook up but this bike doesn’t even have a console screen. While this is a refreshing change it does mean you can’t monitor your distance or speed; making it difficult to outperform yourself. Most accessories can be viewed as unnecessary but the bottle holder is not one of these. In fact it’s essential if you’re intending to cycle for 30 minutes or more. It is possible to add your own holder or basket by drilling the frame but this is an accessory that really should be included. The Schwinn 230 is a well put together bike that would have been my favorite, but it just didn’t feel like it did as much for my strength as the Sunny Pro indoor cycle. Schwinn make bikes. They cover all versions of road bikes, off road bikes and stationary bikes. That’s why they are so good at making them; that’s all they do. The fact that they’ve been doing this since 1895 explains why they’ve become so good at it and are recognized the world over. It’s worth noting that Schwinn also do the 270 which is worth considering. 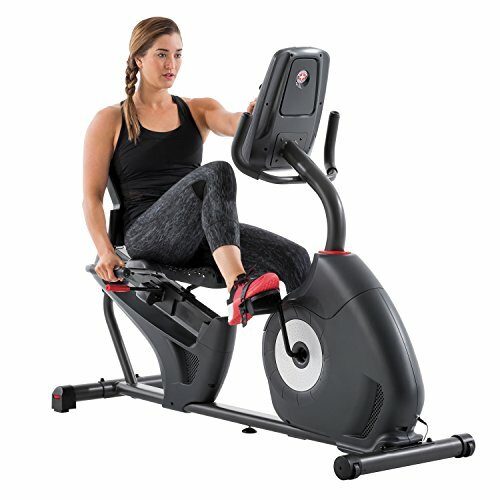 The first thing to note is that there are 22 workout programs, 20 resistance levels and you can connect to Schwinn Connect via USB. This gives you access to all the data from each ride and additional suggested workout routines. The resistance is controlled via an Eddy Current Brake system giving you a great range of settings. The perimeter flywheel and high inertia drive ensure your comfort throughout the ride. In fact it is surprisingly vibration free. The seat is well supported to help ease any bad back and it can accommodate riders up to 300 pounds. In addition there is a water bottle holder, a 3 speed fan to help you stay cool and built in speakers that can be connected to your iPod or MP3 player. You can even put your tablet on the media shelf if you wish. The seat is very easy to adjust via a single handle; allowing any user to be comfortable on the Schwinn 230 recumbent. The dual track two LCD window system allows you to see several pieces of data at the same time. You can even choose one of the preset programs; there are 9 to choose from. 3 are denominated ‘fun’; 3 are mountain rides and the other 3 are challenges. Alongside this there are 2 fitness tests, the ability to store 2 user profiles and 4 heart rate programs. Your heart rate is tracked through the grips on the machine. The flywheel weighs just 14 pounds. This is a little light to give any real resistance as compared to riding on the road. The assembly instructions are actually pretty good but there are a lot of parts involved. This means it can take a considerable amount of time to get it all set up properly. The Exerpeutic 400XL is a more basic offering than that offered by Schwinn but still an effective model. The fact that it folds makes it much easier to store. Exerpeutic is actually a brand of Paradigm Health. This is a company that specializes in all types of health and fitness products. They even have links with the famous Ironman competitions. They are based in the US and strive to bring the best possible products to the market. This bike may have a light flywheel but it is surprisingly stable and capable of holding weights up to 300 pounds. It is worth noting if you’re below 5ft 3” or above 6ft 1” you may find this bike impractical or uncomfortable. The adjustment feature is also worth noting. It has a series of preset holes allowing you to determine what level you’re at. This makes it easy for multiple users and to adjust while exercising. It is also surprisingly quiet; you can still watch the television as long as your heavy breathing doesn’t interfere with the voices. A great feature of the Exerpeutic 400XL is its ability to fold. In use you’ll need approximately 25 inches x 40 inches; to give you room round the bike. But, when you’ve finished you’ll need just 19 inches by 19 inches! It’s almost too discrete to be a clothes hanger! Even better is you can set it up in seconds. All you need to do is slide a pin out, unfold the legs and slide the pin back in. Providing you place the bike on a level floor there is no rocking and the pedaling motion is incredibly smooth. Again this is a surprise since the bike weighs just 39 pounds but the low centre of gravity and the efficient design all contribute to this. Although you can change the resistance this is not a bike that can make you feel like you’re riding up large hills. You certainly can’t stand up in the pedals. If you’re a beginner or looking to simply maintain your current fitness level and knee movement this is a great bike; but you’ll never be able to really push your limits. It is worth noting that the bar is quite high on the Exerpeutic 400XL. 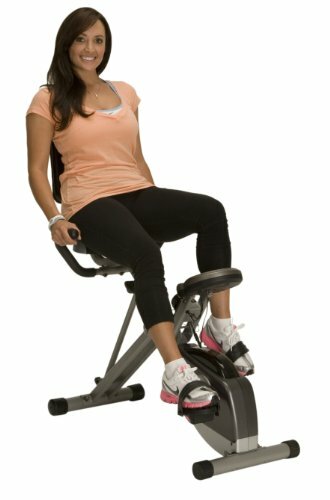 If you’re suffering from a knee injury or bad hips and need to swing your leg over the bike you may find this difficult. As already noted anyone over 6ft 1 inch will be too tall for this bike; it’s only a disadvantage if you are that tall. For the best type of exercise bike rehab knees there is no contest. The Exerpeutic 400XL recumbent and Schwinn 230 recumbent are great bikes. But, the upright position and the feel that I was really working the muscles throughout my body mean that I would take the Sunny Pro indoor cycle every time. The fact that it’s great value for money is simply a bonus.